Easy Peanut Butter Pie Recipe - Best No Bake Peanut Butter Pie! When I say that my easy peanut butter pie recipe is EASY, I really mean that it’s easy. I’m talking no-brainer easy! 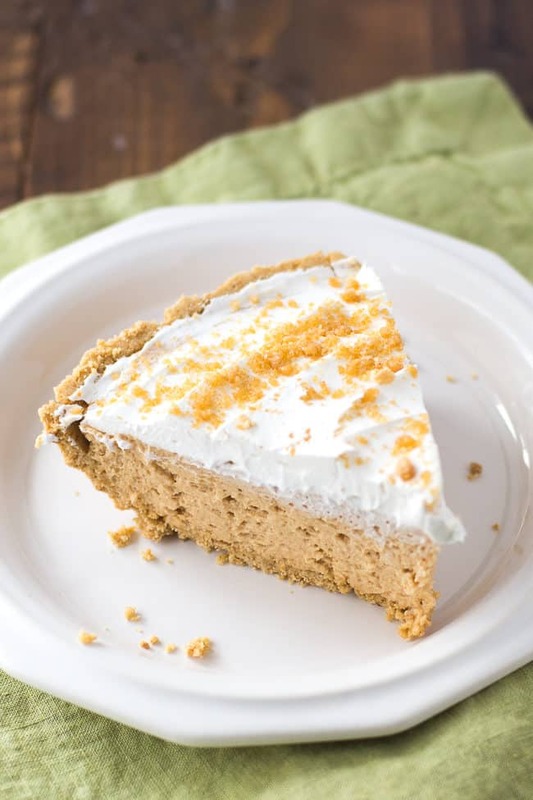 This is my go-to pie recipe for carry-in events and holidays because you can quickly make it using a store bought graham cracker crust and a few simple ingredients. 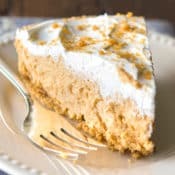 Furtherore, this easy peanut butter pie tastes just rich and creamy as those fancy slices of peanut butter pie that you pay five dollars a piece for at your favorite restaurant! I’m basically obsessed with this peanut butter cream pie. It’s my personal favorite pie right now because the texture is like a cloud. 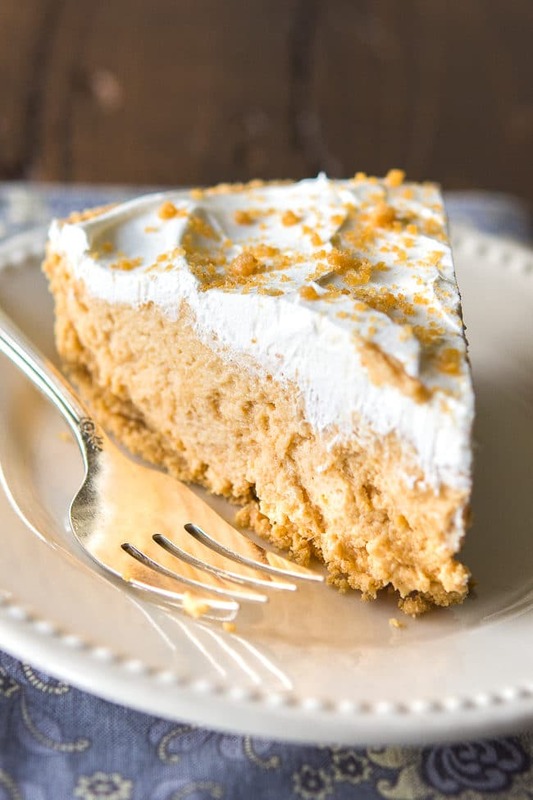 You can make your own graham cracker crust if you want, but I love having a dessert recipe option that is easy to put together and spoon into a store-bought crust. This is a great option if you need to make several pies to take to an event or if you’re going to have a big crowd over for a special holiday meal. I also make a version of this easy recipe that has an OREO cookie crust which is really good as well. If you’re a fan of chocolate, don’t miss my chocolate peanut butter pie recipe. That’s part of what makes this easy pie so great. There are really a number of ways you can make this recipe your own by swapping out some of the ingredients. You can garnish the top of your pie with the peanut butter crumbles that I used here (get the instructions below), with chocolate curls, chocolate chips or even crushed graham crackers. I think these peanut butter crumbles are really pretty so I usually tend to garnish the top of my pie with them. This was originally an Amish peanut butter pie recipe that I got out of an Amish cookbook. I’ve made a few changes over the years, but you really can’t go wrong with those classic Amish dessert recipes. There are quite a few peanut butter pie recipes out there, but I hope you’ll give this one a try. The flavor and texture of the pie is just perfect in my book. 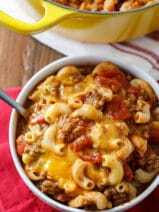 Love Amish recipes? Don’t miss this recipe for the best shoo fly pie. In fact, I’m totally craving a piece right now! RELATED: Like easy, no bake desserts? Don’t miss my easy chocolate no-bake cookies and my famous peanut butter no-bake cookies. PYou can also watch our tutorial video below to learn how to make this easy peanut butter pie. Ejoy! Our simple no bake peanut butter pie recipe is a delicious and quick treat. It’s perfect for holidays, special occasions or any time! 1 9-inch graham cracker pie crust, I used store bought! In a medium bowl beat the cream cheese and the peanut butter until well blended and smooth. Add the powdered sugar and beat until well blended. Gently fold in 1 ½ cups of the whipped topping just until combined. Chill for a minimum of 2 hours or overnight. In a small bowl, using a fork, cut the peanut butter into the powdered sugar until crumbs are formed. I make this same pie, but I like to put Smuckers Magic Shell Chocolate flavor on my graham cracker crust (use a silicone brush to spread it then freeze) then once the shell is frozen, I put in the filling and top with frozen Reece’s Peanut Butter miniature cups (the ones without the paper wrapper) that I broke up in a food processor. My family loves it! So many different things you can do with this pie. 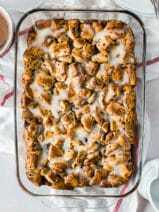 I love your idea for the peanut crumbles on top. May try that next time I make it. Question: Think you could make this pie ahead of time and freeze it? Can’t wait to make it! Thanks! Just as you said, “Easy and Delicious” Family members are adamant that I make it again. I might try switching out the peanut butter for Nutella. 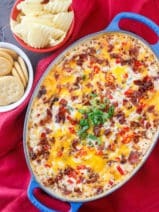 Super easy and omg it’s good! How did you make a gluten free cookie crust? I just followed an Oreo cookie crust but I used gluten free Oreos from Walmart for it! What is topping? I’m Aussie so perhaps lost in transport – we don’t have a product called topping that you thaw – to the best of my knowledge…? Hi Nate, so here we have a product called Cool Whip (which we refer to as ‘whipped topping’) that you buy in the freezer section. Looks like you don’t have that in Australia! You can also use the whipped cream you buy in the spray can or make your own whipped cream. I make this in a chocolate crust with chocolate sprinkles on top. My sons’ all time favorite!! The peanut butter pie recipe is amazing! Super easy to make. A new family favorite! Excellent pie, very quick to make and enjoyed by all. Yay, glad you loved it! This pie looks and sounds delicious. Baking is one of my hobbies. I recently got into no bake goodies. I was skeptical at first, but when I took a bite of the no bake eclair cake, I was hooked. I am definitely going to make the peanut butter pie for Thanksgiving. Thanks for sharing the recipe. I make my peanut butter pie the same way except I add crumbled butterfinger bars to the filling and crumble them over the top! Dee-lish!! Hi Crissy, a lovely and easy dessert to make. Almost everyone loves peanut butter, Thanks for sharing this easy peasy dessert at DI&DI. I am a huge peanut butter lover so I can definitely see making this super easy dessert! Pinning for the future. Make it!!! 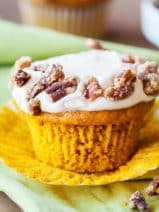 Super easy and super delish! Your Peanut Butter Pie looks amazing! Hope you are having a fantastic week and thanks so much for sharing with us at Full Plate Thursday! 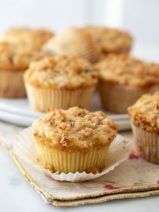 My kids love anything peant butter flavored… they would LOVE this, and I appreciate that it is easy to prepare! Pinning to try later! Oh my goodness, it is easy – and oh so delicious too! Visiting from Miz Helen’s Country Cottage. 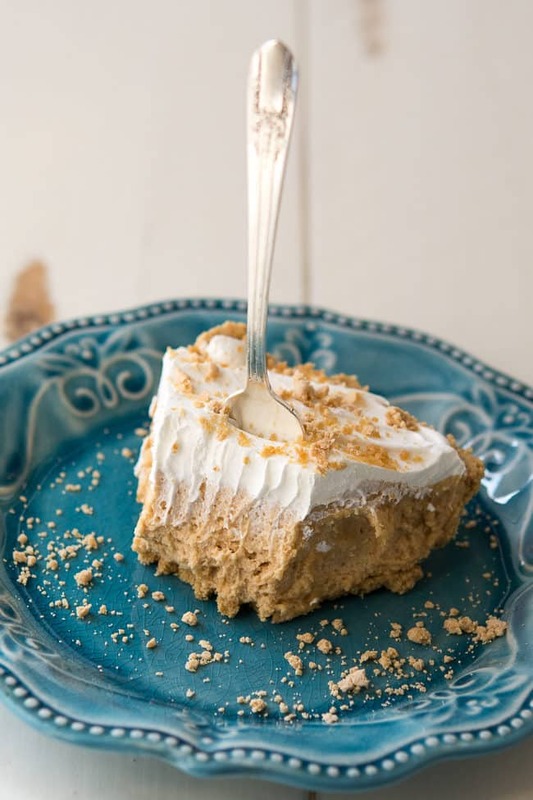 I’d love for you to share this yummy Peanut Butter Pie at my weekly link party – Hearth and Soul too. I hope you will pop by! Popping over from Brag About It to thank you for sharing with us again this week! This pie looks delicious!! Pinned to share! Have a great week.